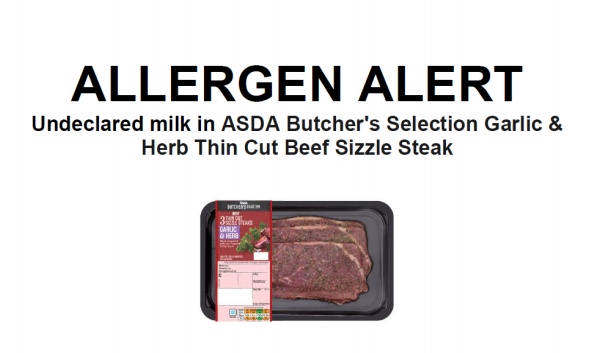 Supermarket chain ASDA has issued a notice recalling its ASDA Butcher’s Selection British Beef 3 Thin Cut Steaks with Garlic and Herb Seasoning as the product contains milk that was not on the product label. This means that the product could pose a possible health risk for anyone with a milk allergy or intolerance. The FSA advises any consumers who suffer from a milk allergy or intolerance not to eat the product, and instead to return it to the supermarket for a full refund. ASDA has also put the recall notice out at all points-of-sale, and relevant allergy organisations have been contacted to notify its members.